Genealogical Library Quarterly. The Augustan Society, Inc. Vol. II, Number 3, Issue 7, 1981, page 125. The Virginia Genealogist. Volume 28, Number 3, July-September 1984. 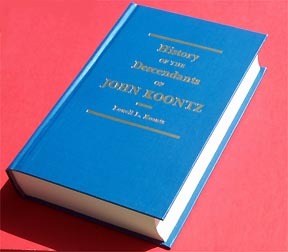 This presentation which covers the Koontzes and many allied families of the Shenandoah Valley should be owned by related Koontz families. Because of the high cost of publication only a thousand copies were published. Currently only 200 copies are available for sale.